The banana in this loaf makes it nice & moist & of course with chocolate chips it's a little naughty! 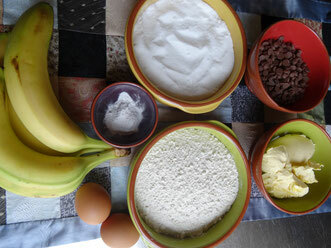 In a large bowl mash together the bananas & sugar with the back of a fork. Add the eggs & mix until fully incorporated & then the butter. Mix again for a couple of minutes to blend everything together. Sieve in the flour & baking powder & fold together with a spatula, then add the chocolate chips. Give everything a final stir then tip the mixture into the prepared loaf tin. Bake for 1hr-1hr 15minutes, or until a skewer inserted into the middle comes out clean. Leave to cool in the tin, then serve in thick slices! Perfect with a cuppa!